After decades of neglect the refurbishment of the Kings Cross Lighthouse Building seems to be underway. 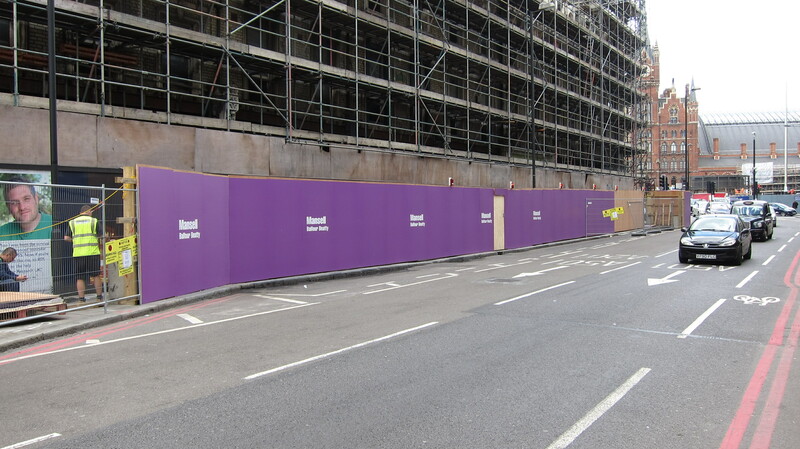 Hoardings are changing as Mansell/Balfour Beatty take over to deliver the site for UK Real Estate. A works canteen/welfare section and an architects office has gone into the old hair dressing suppliers on Kings Cross Bridge (thanks to Chris for tipping me off). It seems from the photo that Mansell are going to create a loading bay on the South side of the Pentonville Road. It is just going to be hard to service this site, which is essentially a traffic island. But local people will all need to remain vigilant for lorries slowing to turn into or pulling out of this bay lest it adds to the considerable danger of the Pentonville Road/York Way junction for all road users especially cyclists, other two-wheelers and pedestrians. The worst result will be deliveries being unable to pull into the bay for any reason and suddenly stopping in mid flow or being in the wrong lane on approach and having to make a sudden adjustment to avoid ‘going around’ the gyratory. Mansell/Balfour Beatty will need to get their best banksman team onto this and brief all delivery drivers. I have asked Balfour for a comment but they haven’t got back to me. The plans for the building are sympathetic, retaining the heritage facade and lighthouse and adding a ‘whaleback’ behind the lighthouse. See planning applications for The Lighthouse Block 283-297 Pentonville Road and 370-380 Grays Inn Road London N1. The whaleback will be transparent in this CGI . In the public interest of understanding the proposal I have included the drawing below which takes an age to download from the Camden site. No 2008/5358/P on the Camden site is the root planning permission. There is an interesting historic buildings survey among the document set. This entry was posted in Planning, Licensing and Regulation and tagged lighthouse building. Bookmark the permalink. Yes, great that this is kicking off. I can only imagine the complexities of renovating that site and no wonder why it has taken so long to kick it off. I saw in the Evening Standard that Co-op had been signed up. Good news. I went to school 5 minutes away in the 70’s and never though the day would come, I always imagined it would end up in the road after a storm. What happened to Mole Jazz and the tattooist? Ten years ago, that was a squat full of punks, anarchists, and 23 year old me. The entire area has changed so much since then. What a great time we had! “The plans for the building are sympathetic, retaining the heritage facade and lighthouse and adding a ‘whaleback’ behind the lighthouse” Horrible! If I had the money, I’d buy it, tear it down and replace it with a small garden and widen the road. As it is, it will be the cause of more accidents. Sad about Mole Jazz. We have no shops of any use whatsoever in Kings Cross, all the decent shops have gone, all we have is “massage parlours” and kebab shops, plus the usual chains. The proposed structure is nasty to the eye, retaining as it does the pointless so-called “heritage” facades and placing an ugly building behind it whose visible upper parts clash with the style of the facades AND with surrounding architecture. The intended uses are inappropriate for a traffic island in this location. It is a misfortune for our neighbourhood. But money talks, just as it did when Bacofoil house was erected opposite my house in King’s Cross Road with clearly the views of local residents and businesses of extraordinarily little interest to the decision makers. OMG anything will be better than the dereliction and it will set the renovated stations off nicely. Its so good to work in Kings X and see this transformation knowing a hole it was for so long. A character-filled hole but its definitely waaay over due for the revamp. 🙂 Hope they do a good job of keeping the old with the new.. I lived in there in 1999-2000. First digs in London, and after you got used to the ThamesLink train rattling everything as it passed underneath, it was a great location. I hope they are doing justice to it. Well about time! The pavement in this busy street has been blocked to pedestrians for THREE YEARS, I have complained many times to Camden Council who have done nothing about it. “But local people will all need to remain vigilant for lorries slowing to turn into or pulling out of this bay lest it adds to the considerable danger of the Pentonville Road/York Way junction for all road users especially cyclists, other two-wheelers and pedestrians”. So it will now change from a no-go area to a deathtrap. Nice one!